We’d love your help. Let us know what’s wrong with this preview of Humboldt by Emily Brady. Say the words "Humboldt County" to a stranger and you might receive a knowing grin. The name is infamous, and yet the place, and its inhabitants, have been nearl In the vein of Susan Orlean's The Orchid Thief and Deborah Feldman's Unorthodox, journalist Emily Brady journeys into a secretive subculture--one that marijuana built. To ask other readers questions about Humboldt, please sign up. This was a solid three-star read, but it gets an extra star for being about a subject that is particularly close to my heart. As a Humboldt native who grew up relatively insulated from the county's ubiquitous illegal marijuana production, I became increasingly interested in the subject as I got older and realized what a huge role pot plays in the local economy. This book is an interesting glimpse into the lives of growers and normal citizens whose lives are tied to the local drug trade. I grew u This was a solid three-star read, but it gets an extra star for being about a subject that is particularly close to my heart. As a Humboldt native who grew up relatively insulated from the county's ubiquitous illegal marijuana production, I became increasingly interested in the subject as I got older and realized what a huge role pot plays in the local economy. This book is an interesting glimpse into the lives of growers and normal citizens whose lives are tied to the local drug trade. I grew up in Northern Humboldt and haven't spent a lot of time in SoHum, so my familiarity with most of the settings in this book was superficial. Still, it was wonderful to read Brady's descriptions of the redwoods and the natural landscapes of the place I call home. While I can't speak to the accuracy of her portrayal of the lives of growers, she certainly nailed it in her descriptions of the Humboldt vibe. I am about to move back to Humboldt with my girlfriend and begin my adult life there, so I am very interested in how the eventual legalization of weed will affect the local economy. I support legalization, but I don't want many of the beautiful little towns in the area to disappear if weed suddenly plummets in price. I wouldn't mind, however, the dissolution of the wall of secrecy and danger that lingers behind the redwood curtain. Even if it comes with a temporary or even permanent economic price, I still think we need to legalize weed and bring its production, distribution, and consumption out of the shadows. I usually don't have such a personal stake in books, and I found it hard to go through this narrative in an objective way. It really broke my heart to read about all the violence that has occurred over the years because of marijuana, much of which I'd never heard about. After reading this, I am much more grateful that I didn't grow up with the marijuana trade being a big part of my life. Northern California has always been a big and mysterious piece of the country to me. Loggers, fishermen, students, shop owners all wrestling something out of this beautiful country. It is surprisingly rugged and remote much more so then Oregon Coast where I have lived in the past. I was down there recently and recalled all of the information that had been subconsciously been entering my mind over the years about marijuana and pulled off the main road to drive through Garberville. It did not take Northern California has always been a big and mysterious piece of the country to me. Loggers, fishermen, students, shop owners all wrestling something out of this beautiful country. It is surprisingly rugged and remote much more so then Oregon Coast where I have lived in the past. I was down there recently and recalled all of the information that had been subconsciously been entering my mind over the years about marijuana and pulled off the main road to drive through Garberville. It did not take long to drive through and out but I mentioned to my wife surely someone has written about this community. We stayed that night in Fort Bragg and got up the next morning to explore Mendocino and lo and behold this book was sitting in the local book store. This book lets you look beyond what you see and explains why you cannot see it. There is nothing unseemly or outrageous here but just a story about people living a beautiful a rugged part of the country that use to depend on logging and fishing. It follows the lives of four people who live in this country. Rural America is beautiful but hard to live in because of employment. These people are pioneers. As a side note I would like to thank the owners of the shops in these small towns including the book store where I bought this book. I browsed for about 30 minutes. I could have bought this home on Amazon for $20.34 but I paid $27.00 for it here. The marginal cost of $6.66 is the price of a coffee and Danish from a neighboring coffee shop. Why are we willing to spend money on a coffee and Danish and deprive a book store owner of the right to compensation for exposing me to a book like this? Moral of the story support the book stores you browse. Buy something so they will be there in the future to offer a respite and educational experience for us all. Beginning in the sixties a lot of people joined the ‘Back to the Landers’ in an effort to live closer to the earth and ‘be the change’ that they wished to see in the world. For many in Humboldt County, under the beauty and grandeur of the Redwoods in the wilds of Northern California, this meant growing marijuana for a living. Through a narrative of investigative journalism, Emily Brady illustrates the people and struggles of this relatively unique area through they eyes of its residents. While sh Beginning in the sixties a lot of people joined the ‘Back to the Landers’ in an effort to live closer to the earth and ‘be the change’ that they wished to see in the world. For many in Humboldt County, under the beauty and grandeur of the Redwoods in the wilds of Northern California, this meant growing marijuana for a living. Through a narrative of investigative journalism, Emily Brady illustrates the people and struggles of this relatively unique area through they eyes of its residents. While she interviewed hundreds (“some days it felt like everyone”) she offers a glimpse into life in Humboldt from the perspective of four representative people. ’Mare’ the older hippy woman and one of the original residents who grows only a few plants to supplement her income. ’Crockett’ who is second generation but works for others, grows and sells as much marijuana as possible. ’Bob’ the local police officer who is trying to do his job in the most respectful way possible considering that he is living in a county where most people make their money through an illegal industry that may or may not gain legality in the near future. And Ms. Worldpeace, a girl who grew up in Humboldt, moved away, and realized that her childhood was very different from that of most other people she meets in Berkley. Ms. Brady’s presentation seems to be a fairly honest representation of the lives of those living in Humboldt County and through their individual perspectives she captures a lot o the issues that are being raised about marijuana and the cannabis sales o both a national level and a (Humboldt) local level. It as an interesting and quick read that will almost certainly shed light on a culture with which many are unfamiliar. A very engaging read that draws you in immediately with a colorful cast of characters... but it's all strictly nonfiction! Strongly recommended, for advocates, opponents, and everyone in between. This is a fun and light read yet an excellent account of Humboldt's marijuana culture told through the life stories of four characters. I highly recommend it. A really fascinating look at a community on the brink of dynamic change. Reads like fiction, but with all the interesting details only nonfiction can provide. A quick and thought-provoking read! Wow. What an incredible insight into such a taboo subject. Brady has really captured the personal and human side to the marijuana trade. It tells like a sequence of separate stories that all intertwine to paint a delicate picture that leaves the reader with so many questions and an alternate view of this often negatively cast subject. Humboldt told the story of the marijuana industry in an off the grid community. The book shares the perspective of a variety of Humboldt residents with different roles in the marijuana trade. This was book was informative, interesting and shared diverse perspectives from a variety of people living in the community relying on the black market marijuana growers. An interesting look at the economic and social impact of marijuana growing and legalization in rural Northern California. Interesting essay on the marijuana economy and culture present mostly in southern Humboldt County in California. Quick, interesting read. Very topical for today’s controversies. Humboldt county, sparsely-populated, green, surrounded by ancient redwood trees, is, in some ways, the epicenter of marijuana production in the United States. In the 1960s, hippies fleeing corporate greed and the government's violence and hypocrisy built communities here. Now, the place is inhabited by the families they established and, increasingly, by opportunistic businesspeople who have transformed the cultivation of marijuana from a small-time, family affair into a powerful, community-defin Humboldt county, sparsely-populated, green, surrounded by ancient redwood trees, is, in some ways, the epicenter of marijuana production in the United States. In the 1960s, hippies fleeing corporate greed and the government's violence and hypocrisy built communities here. Now, the place is inhabited by the families they established and, increasingly, by opportunistic businesspeople who have transformed the cultivation of marijuana from a small-time, family affair into a powerful, community-defining industry. There is perhaps no other place where the ups and downs of the United States' ban on marijuana have been experienced more intensely. The people of Humboldt have built schools and enriched their community in numerous other ways using marijuana profits. They have also been invaded by the U.S. military, raised their children behind suffocating cloaks of secrecy, and lost too many friends and neighbors to the violence that always accompanies underground markets. I decided to read the book after the University of Texas, where I work, named it its "First-Year Forum" text for the 2014-15 school year. To clarify, this means that all students who enroll in the first-semester composition course--several thousand, in total--will be required to purchase and read the book, and then to research and write about the controversies it raises. The obvious one is whether marijuana should be legalized, for either medical or recreational purposes, at either the state, national, or even international level. However, the stories the author shares raise additional questions, some of them more specific, all of them reminding me that the legalization debate is connected to other pressing social issues. If marijuana is to be legal in some capacity, how is it to be grown? Is the industrial method, which raises thousands of plants in record time under intensely-hot bulbs, sustainable? If marijuana is to be restricted, how should we deal with offenders? Is it right to send as many people to prison as we have for dealing and consuming pot? What do we make of the fact that the majority of these prisoners are black or Latino? If the United States legalizes (or continues to criminalize) the use of marijuana, what will the consequence be for the other countries from which we import so much of the drug? What responsibility do we have to help our neighbors--for example, Mexico--control their marijuana production? These are just a few examples. Since I live in Humboldt County and I have heard a lot about this particular book, I decided to read it to become more educated about the marijuana legalization issue, which is to be on this November's ballot once again in California. The author spent years with several people in Humboldt County to immerse herself in the cannabis culture so that she could write a realistic book about the subject. She uses her interviews with four main characters: Mare, Crockett, Emma and Bob, to illustrate four Since I live in Humboldt County and I have heard a lot about this particular book, I decided to read it to become more educated about the marijuana legalization issue, which is to be on this November's ballot once again in California. The author spent years with several people in Humboldt County to immerse herself in the cannabis culture so that she could write a realistic book about the subject. She uses her interviews with four main characters: Mare, Crockett, Emma and Bob, to illustrate four very different viewpoints on the drug. Mare is an "old-school" hippie, Crockett is one of the newer black market growers, Emma is a young lady who grew up in southern Humboldt County and has been around marijuana her entire life, and Bob is a deputy sheriff. I thought the author did a great job in bringing out the various viewpoints of different segments of the population regarding legalization of marijuana. For instance, many of the black market growers do not want legalization to become a reality because their profits would dramatically decrease! (When thinking about the issues, it makes sense). Then there is the viewpoint of Mare and others like her, who are 'old-school' users and growers, who believe the drug should be legalized and grown outdoors in the sun as naturally as possible. One of the most confused and frustrated type person has got to be the law enforcement officer, who in general exists to enforce the law, and many believe that marijuana should be legalized; and then taxed and marketed, etc. so there are no more problems with having to write tickets for infractions, etc. which has been the current status quo since Arnold Schwarzenegger signed this legislation a few years ago. The drug should be either legal or illegal, without all the gray areas that law enforcement runs up against in dealing with it. One of the things that surprised me the most is the fact that many marijuana plants are now grown indoors all year around, with the assistance of diesel powered generators, and with the use of clones rather than growing the plant from seed. There is a school of thought that believes that this is rather a negative thing because not only is it truly not natural, but it also leaves a huge carbon footprint. I had never even thought about this issue, but then I realized when I had read about the name of a strain of marijuana with the name and the word 'diesel' behind it, I had an 'aha' moment when I realized that meant this was clone pot grown indoors. Apparently, the dispensaries that sell marijuana pay over twice as much per pound for this product than they do for the plants grown outdoors. I had never even thought that the same plant grown indoors from clones would ever be prized more highly by anyone. What an education!! This was my first Goodreads book that I received via the giveaways. When I first received the news that I won Humboldt my reaction was "Oh great, a book about marijuana...NOT!!!!!" It certainly would not be a book that I would go and pick up on my own. And as a person who is against people using marijuana for recreational purposes (but waffles about medicinal use) it was not a subject that I particularly wanted to read about especially because I thought I had already considered all the arguments for/against legalization. That said, Brady did an excellent job of presenting the culture that is Southern Humboldt and exposing issues/arguments in a new and thoughtful ways; presenting ideas that I had never envisioned or examined before. Frankly, it never occurred to me that growers would not want their product legalized and I found the reasons why to be extremely selfish but not surprising. The idea of appellations and tasting rooms kind of cemented my reasons against the recreational use of Mary Jane. The last thing we need are more drug induced tragedies created by people driving stoned getting higher and higher as they sample pot legally on a "Marijuana Trail". One of the things I really enjoyed about Brady's writing was that her characters were real, engaging, vibrant and alive. Her exploration of their lives and how marijuana impacted them was thought provoking. It made me feel sorry for all the kids of growers who have to live their lives worrying about their parents and if I bust is imminent. How scary that must be for them. And then there are the home invasions which I suspect would not go away even if pot was legalized. I found Hippie Mare and sheriff Bob to be especially interesting folk and I worried about the safety of each. In fact, throughout the book I was sure Bob was going to be killed by a grower or deal gone bad. They are the kind of people who make legalizing pot seem like a good idea. Finally, Brady's narrative was superb and her ability to weave the tale of the illegal pot industry throughout all aspects of the book made for an excellent read. Her statistics were sobering... especially the those that centered on the fact that minorities were being disproportionally effected by law enforcement. Sadly, that was not surprising and is one of the main reasons I would consider legalization. While her story did not change my mind about whether pot should be legalized for recreational use I learned much.. which is something I look for in a Goodread. Thanks for the book. It was definitely worth reading. I can't say that I really enjoyed this book. The subject matter was interesting, the characters themselves were well presented, and the perspectives offered were occasionally surprising, but the narrative was all over the place. There were too many seemingly random jumps between topics and time, and this made the book a lot harder to follow than it should have been. I admit that my biggest issue with this book, however, stems from the presentation of the subject matter. The author too clearly ha I can't say that I really enjoyed this book. The subject matter was interesting, the characters themselves were well presented, and the perspectives offered were occasionally surprising, but the narrative was all over the place. There were too many seemingly random jumps between topics and time, and this made the book a lot harder to follow than it should have been. I admit that my biggest issue with this book, however, stems from the presentation of the subject matter. The author too clearly had an agenda, and while that doesn't usually bother me--most authors have agendas, no matter what they're writing about--I felt like the author's opinion was more or less being shoved down my throat. It was just too biased to be taken seriously. She tried, for example, to present this pot-growing community as a place where people were good but misunderstood, even comparing the women trimming cannabis flowers to grandmothers in a quilting circle. Much of the book was given to the injustices and trials members of the community faced as a result of their marijuana-centered economy, with a whole lot of it's-just-so-unfair-can't-we-all-get-along pleading. Uh, no. That doesn't work here, because the activity in question is ILLEGAL. People were getting shot over sales gone bad. Parents were arrested in front of their children. Young people were screwing up their lives. My grandmother's quilting circle never caused any of that. I'm not a fan of pot. In spite of the author's claims that it's harmless, I grew up in California, surrounded by users and dealers. Everyone in my area knows someone who died/went to jail/fried their brain over this stuff, and I was really irritated when the author occasionally acknowledged these problems but then immediately tossed in some form of disclaimer or blamed the authorities for the violent consequences. It's also impossible to feel the author's desired sympathy for the parents who lose money or get arrested when they knew what they were doing was illegal and when they knew going in that their activities could and probably would result in something like that. And what about the kids who have to watch the police drag away their parents? Yeah. Harmless. During road trips up and down the west coast, I've stopped in various places in Humboldt County. The beauty of the country is hard to beat and driving or walking among the redwoods never ceases to inspire me with awe. Stopping along Hwy 101, I've been impressed by the friendliness of the people I've met at the restaurants and shops who are easy to engage in conversation, ever eager to answer my "tourist" questions and offer suggestions for things to see, places to eat. On one such occasion in Ar During road trips up and down the west coast, I've stopped in various places in Humboldt County. The beauty of the country is hard to beat and driving or walking among the redwoods never ceases to inspire me with awe. Stopping along Hwy 101, I've been impressed by the friendliness of the people I've met at the restaurants and shops who are easy to engage in conversation, ever eager to answer my "tourist" questions and offer suggestions for things to see, places to eat. On one such occasion in Arcata over four years ago, I learned that there was a "problem" of people growing marijuana in the woods. Having heard that hippies left San Francisco and moved north, I wasn't too surprised by this revelation but I my curiosity of the area was aroused as I learned more about the political leanings of Humboldt County. When I noticed this book listed in the giveaways, I naturally entered my name for a chance to read this book, hoping to learn more about this area and its inhabitants. I was not disappointed as I read and learned about life in southern Humboldt County which I had perceived as an idyllic setting with friendly, easy-going former hippies. I discovered that life in that paradise is not as simple as I had thought. The author tells her story from several viewpoints, an older woman, former hippie and current medical grower of marijuana; a law enforcement officer; a young commercial grower; a young woman who grew up in the marijuana culture of the area, now a social worker and activist in the movement for legalization. I did not realize that marijuana was central to the economic welfare of the entire area and the stories of these four individuals demonstrated the consequences of that economy, crime stemming from the sale of the drug, environmental issues from the cultivation of the plants (i.e. diverting of tremendous amounts of water from the local rivers, tremendous use of energy for bright lights etc. ), the impact to young people growing up in the area (highest number of deaths per year than any other county in Calif.). Slow-paced, even lyrical, this book is a measured look at life in a community where the most important commodity is illegal. It’s difficult to comprehend how big the marijuana crop is to the 1,200 square mile Humboldt County until one reads that 15 to 30,000 workers make their living from the industry. It is “the backbone of the county’s economy”: grower “tithes” fund little leagues and volunteer ambulance services, for example. Through the stories of four “typical” residents, readers get a sens Slow-paced, even lyrical, this book is a measured look at life in a community where the most important commodity is illegal. It’s difficult to comprehend how big the marijuana crop is to the 1,200 square mile Humboldt County until one reads that 15 to 30,000 workers make their living from the industry. It is “the backbone of the county’s economy”: grower “tithes” fund little leagues and volunteer ambulance services, for example. Through the stories of four “typical” residents, readers get a sense of the high-stakes personal profit and macroeconomics behind Northern California’s “redwood curtain.” One of the four profiled is Crockett, a lifelong grower whose seasonal crop may earn over $1 million (cash!) and who plans to “sit in his cabin and guard the crop with his life”; in contrast, Mare grows maybe a half-dozen plants a year. Some of Emma’s earliest memories are of falling asleep with her baby brother in her mom’s beat-up car while waiting for a buyer to show up. And Bob is a progressive deputy sheriff who says, “We just need to acknowledge that we lost the war on marijuana.” What all four agree on is that legalization would kill the market (it’s the scarcity and risk that makes it profitable). VERDICT An excellent book; even nonsmokers and those who feel the pot debate is an outlier among national issues will be won over by Brady’s brand of reportage and fine writing. Humboldt: Life on America's Marijuana Frontier provides a rare and enlightening look into the history, culture and individuals that populate this picturesque Northern California community. Author Emily Brady immersed herself in Humboldt life for over a year, and offers an insider's look at the County's marijuana culture through four distinct points of view - a young, money-minded grower in Humboldt, an original "settler" of the area during the counterculture era, a youth's perspective of growing Humboldt: Life on America's Marijuana Frontier provides a rare and enlightening look into the history, culture and individuals that populate this picturesque Northern California community. Author Emily Brady immersed herself in Humboldt life for over a year, and offers an insider's look at the County's marijuana culture through four distinct points of view - a young, money-minded grower in Humboldt, an original "settler" of the area during the counterculture era, a youth's perspective of growing up in Humboldt, and that of a local law enforcement officer. A well written and engaging book about the marijuana industry and its effect on a corner of Humboldt County. I picked up this book because I have relatives who live in Humboldt (not at all involved with this line of business) and I'm always blown away by the natural resources and drop dead gorgeous scenery when I visit. But we're also warned not to wander onto private property, not to linger too long where we aren't known, and to just plain stay away from certain areas (although to be fair, my r A well written and engaging book about the marijuana industry and its effect on a corner of Humboldt County. I picked up this book because I have relatives who live in Humboldt (not at all involved with this line of business) and I'm always blown away by the natural resources and drop dead gorgeous scenery when I visit. But we're also warned not to wander onto private property, not to linger too long where we aren't known, and to just plain stay away from certain areas (although to be fair, my relatives are more concerned about the recent uptick in meth labs than they are about the marijuana growers). It's an interesting look at who is involved in the industry and the amount of money it represents, as well as detailing the change in who grows and how that has occurred over the last fifty years. In hindsight, it makes perfect sense, but at first I was surprised to learn that Humboldt growers don't want marijuana to be legal - because they fear the depression in prices that will occur once it is no longer illegal. I'd love to read a follow up to this book in the aftermath of the Washington and Colorado legalization - did prices depreciate, or did increased demand lead to even greater sales? And what would that mean to California? You always know you've got a good book when you finish it in a short matter of days or hours. 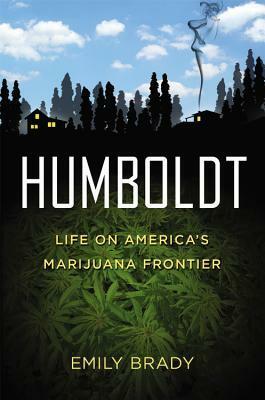 I thoroughly enjoyed journalist Emily Brady's book, Humboldt: Life on America's marijuana frontier. It has achieved the prestigious place amongst my category of "Emily's all time best reads". Previous books that have also gained this status are Wild by Cheryl Strayed and The Help, by Kathryn Stockett. Brady's book is in the narrative nonfiction genre, one that I enjoy for its focus on storytelling but bas You always know you've got a good book when you finish it in a short matter of days or hours. Brady's book is in the narrative nonfiction genre, one that I enjoy for its focus on storytelling but basis on real life events. It provides real stories where the true identities of its characters are obscured in favour of gaining an unrestrained insight into their unique experiences. The year that is focused on in the book is 2010 and, like the author says in her thoughts on the book, it is just a brief snapshot into the complex and interesting history of Humboldt's relationship with cannabis. Upon finishing the book, I was inspired a little of my own research into the subject. I LOVED this book. The author tells a journalistic political story through narative characters. It was a great read. Humboldt is a narrative exploration of an insular community in Northern California, which for nearly 40 years has existed primarily on the cultivation and sale of marijuana. It's a place where business is done with thick wads of cash and savings are buried in the backyard. In Humboldt County, marijuana supports everything from fire departments to schools, but it comes with a heavy I LOVED this book. The author tells a journalistic political story through narative characters. It was a great read. This portrayal of Humboldt is comprised of the tales of four individuals: the business-minded grower, the marijuana activist, the SoHum-born non-grower, and the deputy sheriff assigned to the area to navigate the territory of 215 laws. The author, Emily Brady, pieces these glimpses of Humboldt life together well in an easy-to-follow and engaging story. Following the story, it's not too terribly difficult to surmise the author believes marijuana should be legalized. Obviously, this is a very compl This portrayal of Humboldt is comprised of the tales of four individuals: the business-minded grower, the marijuana activist, the SoHum-born non-grower, and the deputy sheriff assigned to the area to navigate the territory of 215 laws. The author, Emily Brady, pieces these glimpses of Humboldt life together well in an easy-to-follow and engaging story. Following the story, it's not too terribly difficult to surmise the author believes marijuana should be legalized. Obviously, this is a very complex issue that no one is going to delve too deeply into in a goodreads review. I feel that for a non-Humboldt native she does a fair job of balancing the differing opinions held by growers and non-growers alike here behind the redwood curtain. What she fails to explore on a deeper level is the economic impact of legalization in Humboldt County. This is touched upon briefly, but could use greater expansion. A great overview and presentation of the different angles through real characters who are brought to life well. Doesn't glamorize or condemn, but paints a clear picture (and none of it involves illegal Mexican cartels in the CA mts). Not only did I learn about Humboldt life, I learned a lot more about what's going on in my new home of Oakland. I was happy with the feedback Mare got from Harborside. Hopefully she will continue the fight so even weed doesn't get anesthetized and corporatized like A great overview and presentation of the different angles through real characters who are brought to life well. Doesn't glamorize or condemn, but paints a clear picture (and none of it involves illegal Mexican cartels in the CA mts). Not only did I learn about Humboldt life, I learned a lot more about what's going on in my new home of Oakland. I was happy with the feedback Mare got from Harborside. Hopefully she will continue the fight so even weed doesn't get anesthetized and corporatized like many other things that began as original and independent in this country. Borrowed from a friend at the office. I was interested in the book primarily because I am familiar with the area. Many of the towns and streets mentioned are one that I have either been to or heard of. The marijuana saga was quite interesting. I had always thought that growers would be all for legalization of the crop. Not so. That would mean a heavy hit to the price and mass production would take over. Lots of information about growing. I had no idea that there is a difference in outdoor growin Borrowed from a friend at the office. I was interested in the book primarily because I am familiar with the area. Many of the towns and streets mentioned are one that I have either been to or heard of. The marijuana saga was quite interesting. I had always thought that growers would be all for legalization of the crop. Not so. That would mean a heavy hit to the price and mass production would take over. Lots of information about growing. I had no idea that there is a difference in outdoor growing compared to indoor growing. Interesting about the cost and environmental affects of both types of growing. Also, very disturbing about how being raised in the hush hush society of illegal activity affects youth. I enjoyed the personalization that the author presented. Each character had a different grow experience and their own personal view of the law. A great glimpse behind the redwood curtain. This part of northern California and southern Oregon has been known for years as the emerald triangle. It's secretive residents brought the area back to prosperity after the lumber industry left. The way they did this was to grow the best cannabis in the world under the sun, the way it was always grown. Adapting to the changes post 215 and the continual change the industry has gone thru. Emily focuses on 4 growers, and we get to see these changes fro ea A great glimpse behind the redwood curtain. This part of northern California and southern Oregon has been known for years as the emerald triangle. It's secretive residents brought the area back to prosperity after the lumber industry left. The way they did this was to grow the best cannabis in the world under the sun, the way it was always grown. Adapting to the changes post 215 and the continual change the industry has gone thru. Emily focuses on 4 growers, and we get to see these changes fro each persons experiences. And captures the history of the back to the land movement that birthed so many communes that popped in the early 70's. Really glad this book exists to document this hardy breed of out of the box thinkers who put their beliefs on the line, funding their families with sales of cannabis. Emily Brady is the author of "Humboldt: Life on America's Marijuana Frontier." A graduate of San Francisco State University and Columbia’s Graduate School of Journalism, she began her career at an English-language newspaper in Caracas, Venezuela. Her writing has also appeared in the New York Times, Village Voice, Time, and Smithsonian, among others.